1000 everyday words illustrated with busy scenes and labelled pictures to help children learn key vocabulary. Delightful illustrations by Stephen Cartwright provide lots of opportunities for conversation. 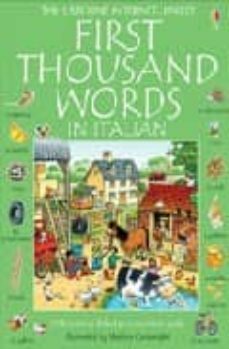 Readers can listen to every word read by a native Italian speaker at the Usborne Quicklinks Website. With an Usborne yellow duck to find on every double page! This book is aimed at younger language learners, I am much older (early 20's) and am finding this book extremely useful for basic everyday nouns. Easy to use, the pictures make it much easier and faster to learn a new word rather than translating directly from my first language. To help with pronunciation the website link, is invaluable.